Leun achterover en verken Victoria in stijl op deze 1,5 uur durende Victoriaanse tuin en fietstaxi's langs de kust. Spin langs Victoria's rustige straten aan zee met je gids en bewonder traditionele erfgoedhuizen, prachtige parken en kleurrijke tuinen. Geniet van een panoramisch uitzicht over de oceaan terwijl de met sneeuw bedekte bergen in de verte oprijzen. Ontdek lokale bezienswaardigheden zoals het huis van Emily Carr en Fisherman's Wharf, waar speelse zeehonden door de golven spatten. Leer over de geschiedenis van de stad en verken Beacon Hill Park - de thuisbasis van levendige flora en fauna, inheemse adelaars en groene weiden. Thoroughly enjoyed a great Garden and Seaside Pedicab tour. We were on the Clipper from Seattle to Victoria BC and were met by "Mike" within steps of walking off the boat. Our guide, Mike, was full of historic information that made the tour quite interesting. You will see homes and gardens that you would not otherwise see from exploring on your own. 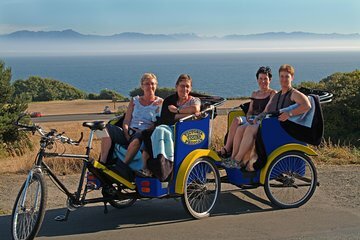 I would recommend taking this pedicab tour if you get the chance. Well worth the time. She explained to us about the first settlers here in Victoria and took us to a beautiful park where wild peacocks live. Heloise gave us peanuts to feed them in which they ate out of our hands. The seascape had white caps and looked so spectacular! Also to my daughter and I to one of the oldest storefronts where the best chocolate is made. Heloise was such a delight and so informative!! So glad we took the pedicab shortly after arriving in Victoria from the Coho Ferry. Time well spent for sure! I highly recommend Heloise for your pedicab tour!!! Loved Juliie..she had lots of good info and very upbeat. Only draw back was our 1 1/2 tour was barely over 1 hour. Downtown area would have been nice to see to get more history on it, not just historical homes. Gardens were very nice. My Victoria pedicab tour even exceeded I was hoping for! Julie was wonderful about tailoring our time to share the beautiful James Bay Area and Fishermans Wharf areas, focusing on off-beat sights, gardens and hidden neighborhood gems. Throughout the tour, she shared lots of historical tidbits and interesting facts about this wonderful neighborhood that I would not have discovered in any other way. Julie and the ride in her distinctive pink pedicab were a total delight...I learned so much and had so much fun on this off-the-beaten path adventure! Great way to tour Victoria. Being just the two of us gave us a chance to have our questions answered and choose what we would like to see. I can't remember our guide's name but he was very knowledgeable of Victoria's history and stopped so that we could take photos and even gave us a short walking tour. He could even refer his favorite restaurants and had sample menus. All in all, it was fun. We loved this excursion! Victoria is so beautiful and our guide was amazing! First, their customer service is top notch. They responded to my email quickly before the trip and they were right there and ready to go when I arrived at the port. They even knew my name. Gerry was my driver. He was super friendly, courteous and professional. I had such a great time that he let me extend the trip for another hour so I could see more of the city. I would highly recommend this as an excursion in Victoria BC. It's very reasonably priced, you get to spend time outside, you see most of the key sights in town, and it's fun!